Our products have a low power consumption and the battery standby Life is busy. People may temporarily amnesia, especially the elder and children are easier to forget things.It is hard to look for the thing what you have lost immediately. But if you have key finder,No need to match,with just one press on the button of the transmitter,the corresponding color receiver will lead you to locate and find the lost item. Key finer make your life become intelligent and help you solve the small trouble in the work or life. 5 RECEIVERS:Key finder has 5 receivers,attach the receives to any 5 items and simply press the color-coded buttons to locate them. Easy to use and operate. SOUND & LIGHT:The key finder with modern and beautiful design,and the receiver is only 0.2inch,lightweight and convenient. Receiver sounds/beeps, leading you to your lost item. The remote control is equipped with a light for better night visibility when locating the buttons. Low-Energy Consumption:Most of the key finder can only be used 1-2 months,but this product key finder can be used 6-12 months and it is easy to replace CR2032 battery. Save Your Time: Life is busy. People may temporarily amnesia, especially the elder and children are easier to forget things.It is hard to look for the thing what you have lost immediately. 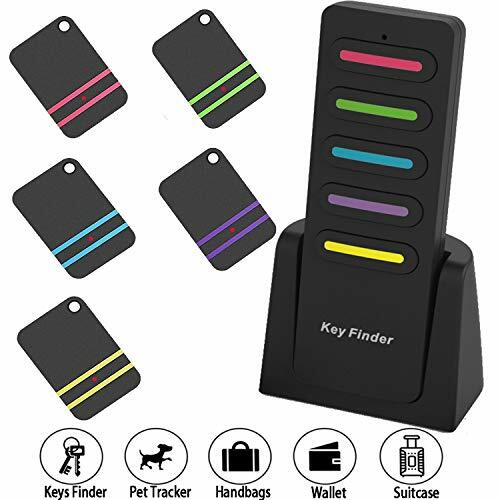 But if you have key finder,No need to match,with just one press on the button of the transmitter,the corresponding color receiver will lead you to locate and find the lost item. 100 Feet Range：Radio-frequency signal can penetrate through walls, floors, cushions, leather, etc to help find your item up to 100 feet away .Perfect for use indoor or in the garden and yard .